Originally published September 2017, updated charts to interactive charts June 2018. The Auckland private rental market is now well into oversupply with listings well above the normal trend for this time of year. It is interesting that, along with Christchurch there is no other part of the country in this situation - other cities are exceptionally short of private rental housing - this factor may be a contributor to the reduction of sales in Auckland, i.e. it is harder to find a tenant. The two chart below are the same data. �The first shows actual listings on Trademe each Monday, the second shows the variation from the last 4 years average at that time. 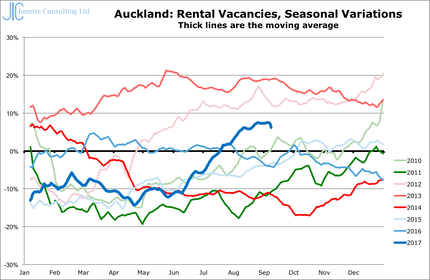 �Only 2009, 2012 an 2013 had more listings for rent in Auckland than the current levels. � Notice that the first one shows the seasonal nature of listings, with more in winter and at the end/beginning of the university year. Why is our data showing there a surplus when there are people sleeping on the streets? �Simply because this�measure is of Private rentals advertised on trademe, and does not include social housing, which of course does not advertise. The next chart is the same data, but converted to the difference between the actual measure and the previous 4 years at the same time. �i.e. it shows the difference in terms of what would be expected at this time of year.